Pop-Tarts® came onto the market in 1964. And what a novel idea it was. A handheld breakfast food that you could eat on the way out of door. At first Pop-Tarts® consisted of two rectangular pieces of pastry sandwiched together with a filling. They weren't frosted. That came later, in 1967. I remember loving them as a kid, probably because they seemed more like a dessert than the more traditional breakfast foods that I was used to eating. Since they were pre-baked, the idea was to reheat them in your toaster. But I could never bother with that step, I just ate them right out of the package. Now, these homemade Pop-Tarts® don't taste exactly like the ones you buy. I think of them more as a handheld pie. And they are delicious. You have two rectangles of buttery pastry, sandwiched together with a tart and tangy raspberry jam (preferably homemade). Of course, the finishing touch is a sugary powdered glaze and colored sprinkles. Since I like to make all of my Pop-Tarts® the same size, I make a template. This step is actually a time saver, as it makes it so easy to roll out your pastry and then to cut out the individual rectangles. Otherwise I find you're constantly measuring, reshaping, cutting, and re-rolling your pastry. There are many fillings for Pop-Tarts®. My personal preference is to use my homemade raspberry jam. I really like how the sweet tanginess of the jam combines with the buttery pastry and how it offsets the sweetness of the powdered sugar glaze. Of course, you can use store bought jam, any flavor really, as long as it's nice and thick. Other fillings you can use are Nutella, chocolate ganache, a mixture of light brown sugar (1/2 cup (100 grams)) and ground cinnamon (1 teaspoon), or even a layer of peanut butter and jam. Pastry: In your food processor, place the flour, salt, and sugar and process until combined. Add the butter and process until the mixture resembles coarse meal (about 10 seconds). Sprinkle about 2-3 tablespoons of water over the flour mixture and process the dough just until it holds together when pinched. (You don't want a solid ball of dough.) If necessary, add more water. Then take your template, turning the parchment paper over so the template is on the bottom, and scatter the pieces of dough within the borders of the 12 x 9 inches (30 x 23 cm) rectangle (See Video for demonstration). Cover with a second piece of parchment and, using the template as a guide, roll the dough to a even thickness. Periodically check the top and bottom sheets of parchment and smooth out any wrinkles. Then slide the pastry, along with the parchment paper, onto a baking sheet and place in the refrigerator until the pastry is firm (about 30 - 60 minutes). Once chilled, remove from refrigerator and peel off the top piece of parchment paper. Take a pastry wheel, pizza cutter, or sharp knife and cut the pastry into 8 - 3 x 4 1/2 inch (7.5 x 11.5 cm) rectangles, using the template as a guide. Next, place four of the rectangles of pastry on a parchment paper lined baking sheet. These will be the bottoms of your Pop-Tarts®. With a pastry brush, brush the outside edges of the rectangles with the beaten egg. Spoon a heaping tablespoon of jam in the center of each rectangle. Place a second rectangle of pastry on top of the first. Use your fingertips to gently press down the edges of the top rectangle of pastry to the bottom pastry. Then, with the floured tines of a fork, seal the edges. Cover and place the baking sheet of unbaked Pop-Tarts® in the refrigerator to chill. Meanwhile, preheat your oven to 350 degrees F (180 degrees C), with the oven rack in the center position. Remove the Pop-Tarts® from the refrigerator and brush the tops of the pastry with the egg wash. Using a toothpick or the tines of a fork, prick the tops of the Pop-Tarts® as this will prevent the pastry from puffing up during baking. Bake for about 28-30 minutes or until the Pop-Tarts are nicely browned around the edges. Remove from oven and place on a wire rack to completely cool. Glaze: While the Pop-Tarts® are cooling, in a small bowl, mix the powdered sugar with the vanilla extract and just enough milk (or cream) to make a smooth and spreadable glaze. Then, using a pastry brush, brush the tops of the cooled pastries with the glaze. If desired, sprinkle with colored sprinkles. 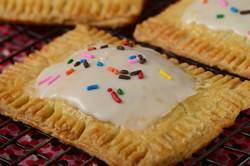 Let the Pop-Tarts® sit at room temperature for about 15-30 minutes to allow the glaze to dry. The Pop-Tarts® can be stored, in an air tight container, at room temperature, for about 2-3 days, or they can be frozen. Pop-Tarts and Kellogg's are trademarks of Kellogg's NA Co.